THERE IS A CONVERSATION I seem to have again and again when talking with Buddhists. It's about what science is, and how scientists employ the scientific method. Given that we all study science at secondary school, how is it that so few people seem to understand the role of scientists or the process of advancing scientific knowledge? Given the central importance of the applications of science in the modern world, can we afford to be so ignorant? I have a little confession to make first. I've never read Karl Popper's books on the scientific method. And I never heard of him while studying science at school or university. I read of Popper only as an adult. Particularly in the book "Wittgenstein's Poker", but also in books and lectures by Richard Gombrich whose father was a personal friend of Popper. The young Richard proof read the seminal work Conjectures and Refutations, and it obviously had a powerful effect on him. 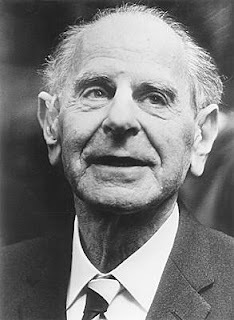 Popper is probably the most important figure in the philosophy of science to date. It was he who definitively described what science is and is not, and I want to review my understanding, in the hope that others will appreciate science better, but also so I can point to this essay in inevitable future arguments. Although I've just been using science as a proper noun, I want first of all to make the point that science is not an entity. We say things like "science says..." or "science does..."; but science in this sense simply doesn't exist. There is no distinct agent or entity which we can name. There is no doubt a body of evolving knowledge. There is a community (or even one might say an ecosystem) of people employing the scientific method of conjecture and refutation (with it's parasites known as science journalists whose method is more like rejecture and confutation). But there is no entity present in all of this - this is a point Buddhists, of all people, ought to be able to appreciate. Science is anātman, asvabhāva, śūnya. At best "science" is a place holder for the body of knowledge and practice, and the community of practitioners. It's very like Buddhism in this sense - there is no single entity or agent identifiable with Buddhism, and finding something we all have in common is difficult; and that commonality exists only on the most general level. As soon as we begin to specify what makes a Buddhist, then Buddhism begins to splinter. A scientist is anyone who practices the methods of science. All scholars who advance knowledge follow a process of conjecture and refutation. I put forward a conjecture and my grounds for doing so, and I ask my peers to refute it if they can. If it can be refuted then I drop it, and move on to the next conjecture. Science applies this method to the phenomenal world (rather than, say, to literature or history). Religion on the other hand begins with the Truth, and asks us to change our minds until we completely agree with the Truth. No challenge to the Truth is possible, since it is True. Certain strands of religious Buddhism are like this also, and in that sense very far removed from science. Religion also often posits a noumenal world, by which I mean knowledge not related to phenomena. This is an oxymoron in Buddhism, but it has an on going appeal across the spectrum of Buddhism for some reason. Within the conjecture/refutation procedure the scientist practices by observing phenomena; creating falsifiable predictive hypotheses about the world; testing their predictions; and through peer review and publication inviting others to test their theory. Although we retain the Enlightenment/Victorian Era language of Laws of Physics, scientists know full well that a theory tested to the limits of human ability is still not proved. It was Popper who in the first half of the 20th century began to formalise this, partly in reaction to Logical Positivists who claimed only verifiable knowledge was valid. The classic example is the notion that since all swans are observed to be white, then the statement "all swans are white" is held to be true. The first Europeans to return from Australia brought shocking news - downunder the swans are black. Black swans are a different species, but they are no doubt swans. Since Popper it's been explicit that any theory may be falsified. Mind you anyone familiar with the havoc wrecked on previous theories by Einstein's oeuvre could hardly feel confident about any view they hold about the physical world. Now non-scientists maintain a number of anachronisms. They seem to think that scientists are stuck in the Victorian Era: trying to prove things, seeking immutable Laws, and believing the equivalent of "all swans are white". While I never studied Popper at school—more's the pity—it's clear that scientists are not stuck in the same Victorian time frame as non-scientists. In fact scientists are all working to disprove everything that we think we know. This is fundamentally what makes science different from religion. Yes, there are scientific "laws", yes there are powerful explanatory theories, but the dream of every scientist is to rewrite those laws, to over-turn those theories. No scientist worth the label is satisfied with the current state of knowledge, and each wants to find a 'black swan' (and have it named after them!). So the scientist makes observations. Often today it is through complicated and expensive machinery. But not always. One of my scientific heroes is Jane Goodall who changed our paradigms with regards to chimps with a pair of binoculars and a notebook. Scientists pay close attention to phenomena and try to describe as accurately and dispassionately as possible what they perceive. Ideally they see something new, but it may be that they simply observe what has been observed before and see it in a new way. Any explanation they come up with—an hypothesis —seeks to predict further observations suggesting that the explanation has grasped the underlying regularity of the phenomena. For example: if after observing a comet, I hypothesise that it is a small body in an elongated elliptical orbit, I can predict when I will see it again. If it does not appear when I predict then my theory is wrong. The fact that it does appear suggests that my theory is useful, not that it is True. But science is not a private enterprise. It is public. So having observed, hypothesised, and tested I then submit my results for publishing. Scholarly publishing subjects all potential publications to peer-review. A group of a scientists peers will read the paper to try to ensure that at each stage the scientist has not made gross errors or leapt to false conclusions. As a trainee scientist I was constantly admonished not to go beyond my data - not to add to my observations from past experience, and especially not to try to make my conclusions fit my hypothesis. Of course this process is subject to problems. Publishing a book can circumvent peer-review, though books also get reviewed even if only after the fact. Scientists more and more seem to announce results to the press rather than their peers. One of the most infamous occurrences of this was the announcement by Pons and Fleischmann that they can observed nuclear fusion at room temperature (while others were seeking it at millions of degrees). Peer review panels are subject to human foibles: they are capable of blocking new ideas; individual animosity may intrude; and they also fail to prevent rubbish being printed. There is sometimes, especially in medical publishing, a bias to only publish the results of studies which support an idea, and to suppress those which do not (a variety of conformation bias). But on the whole the system works well. There is a further step in the scientific method post-publication. For a result to be meaningful or useful, it needs to be repeatable. So a one off result is not worth much. Ideally three or four other scientists or groups of scientists will carry out the same experiment, with the aim of trying to disprove the result or find an alternative explanations, and they will also publish their results. Before a theory becomes accepted as generally useful at predicting future observations, it has to be thoroughly tested. And scientists like nothing more than proving their rivals wrong. The history of science is rife with competitiveness, often devolving in rancorous disputes. Of course these days no one can get funding for merely reproducing someone else's experiment, so what we get a series of overlapping results. A problem for the lay person these days is irresponsible science journalism. Newspapers eager to increase circulation and sell advertising are not famous for their probity (and are often infamous for their lack of it). What the science journalist does is search for journal articles with sensational findings and write a simplified version of the paper for a general readership. Examples of this are legion. The MMR Vaccine controversy is a good case in point. A researcher with multiple conflicts of interest, publishes a single article suggesting a link between the vaccine and autism. Later he is found to have manipulated evidence and broken ethical codes, and not only is the paper retracted, but the author is struck off the Medical register. Meanwhile the newspaper article claiming that MMR vaccine causes autism has gone viral and many parents refuse to vaccine their kids, causing a minor epidemic of measles in the UK (which has not yet abated). A similar story is the "cell-phones do/don't cause cancer" story that runs and runs, not because anything definitive is discovered, because things that cause/cure cancer sell newspapers. So this is my view on what science is, and how knowledge proceeds. Knowledge is always provisional, though of course it may retain it's usefulness. I think lay people often throw the baby out with the bath water. They hear, for instance, that Einstein's theory of gravitation supersedes Newton's, and suppose that Newton's theory of gravity is redundant. But this is simply not true. If I were putting up a building and calculating stresses, or building a new aeroplane, or firing a rocket into space, I simply would not need to use Einsteinian mathematics, and to try to do so would simply hamper my efforts. I would use Newtonian mathematics. All measurements have a margin of error - and real science always gives margins of error when stating a measurement. The margins of error, though very much greater when using Newton's equations still amount to a few parts per billion in most of the applications I might be interested in. If accuracy of more than a few parts per billion is required then one switches. The idea that scientists themselves see their theories or mathematical equations as dogmatically True is wrong in most cases (there are still a few Logical Positivists around, but we need not give them much credence). Though some theories have survived every conceivable test and we simply accept them, the door is never closed. A black swan might appear at any time. hypothesis means 'under-thesis', and thesis means 'a proposition'. The Online Etymological Dictionary relates it to PIE *dhe- 'to put, to do', but also to the Greek tithenai, which suggest to me a connection to Sanskrit √sthā 'to stand, to remain'; c.f. Pāli thāna literally 'place, state' but abstractly something which 'remains' and therefore a 'fact' in the sense of something on which logical conclusions can be based. The story is told in full online in many places. The Wikipedia article MMR vaccine controversy is a good place to start. Additional note on how real scientists think: 14 Oct 2011. "The way many scientists work is that while they're pushing one idea passionately, they always have in the back of their mind that they may be wrong, and they have alternative explanations for the same observations - and I did too... When you find evidence that directly contradicts your favourite idea and you have to switch modes, switch paradigms to a different concept, that's real progress...". Professor Paul Olsen (Columbia University). The shifting face of a 200-million-year-old mystery. BBC News 13 Oct 2011. "There is now no safer occupation than talking bad science to philosophers, except talking bad philosophy to scientists". - Midgley, Mary. 1979. 'Gene-juggling'. Philosophy. 54(210): 439-458.